(AJC) -- Firefighters remained at Tyler Perry Studios in southwest Atlanta early Wednesday, watching for hot spots and trying to determine what caused a spectacular blaze that damaged one of the complex's buildings Tuesday night. "The fire's out, but the cause remains under investigation," Capt. 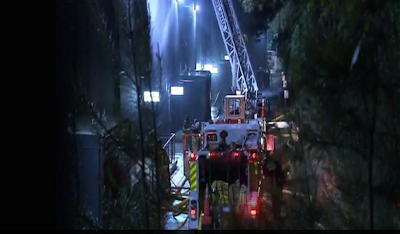 Jolyon Bundrige with the Atlanta Fire Department told the AJC just before 11 p.m.
About midnight, Bundrige said that several fire units were still on the scene, "conducting a damage assessment, including salvage and overhaul." At least one fire truck remained at the studios at 7:30 a.m. Wednesday. Firefighters were able to contain the blaze to one building in the center of the 30-acre complex owned by Atlanta filmmaker Perry, Bundrige said. Perry was at his Continental Colony Parkway complex Tuesday night and spoke with Fire Chief Kelvin Cochran, but did not talk to reporters gathered nearby, Bundrige said. Employees leaving the studio grounds after the fire told reporters they were instructed not to speak to the media. The flames shot as high as the nearby trees, roughly six stories in height, she said. The 200,000-square foot studio, which opened in 2008, is home to sets, sound stages and a 400-seat theater. In March, Perry hosted a fundraiser for President Barack Obama at the studio. Perry has worked as director, writer, producer, actor and playwright. His film credits include "Diary of a Mad Black Woman," "Meet the Browns" and "I Can Do Bad All By Myself." His latest movie, "Madea's Witness Protection," is scheduled to open June 29. Tyler should possibly upgrade his inhouse security. His recent well publicized run in with the unreasonable law enforcement and then exposing them Nationwide coupled with his hosting an Obama fundraiser may not sit well with a certain faction in Atlanta. I am just saying.